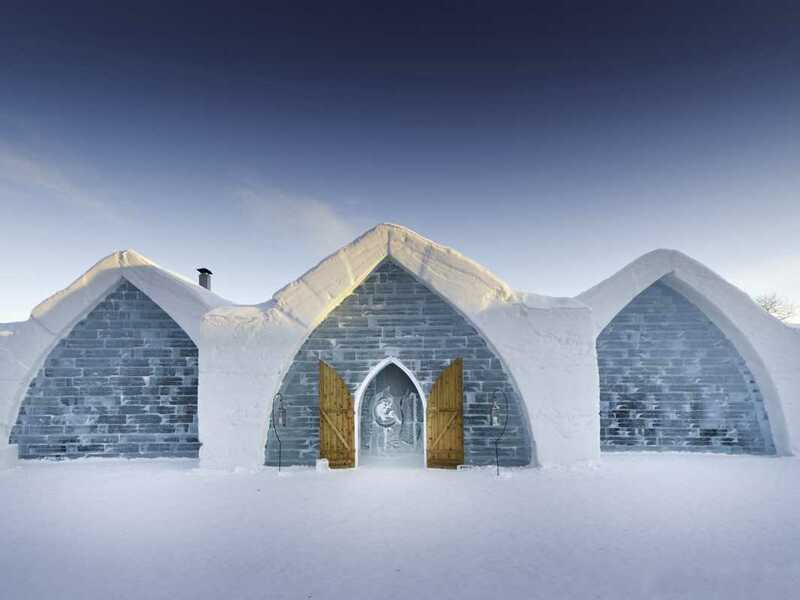 Every year since it was first built back in 1990 the Icehotel in Swedish Lapland gets rebuilt in October and November for the start of the winter season in December so designers, sculptors and artists are all heading to Kiruna to start the annual arctic construction project. Located 11m from Kiruna in Northern Sweden and 200km north of the Artic Circle, the hotel structure and its furniture are constructed using snow and ice blocks sourced from the nearby Torne River. Artists are invited each year to create different rooms or suites plus other items for the hotel following selection of artists by a panel of judges. 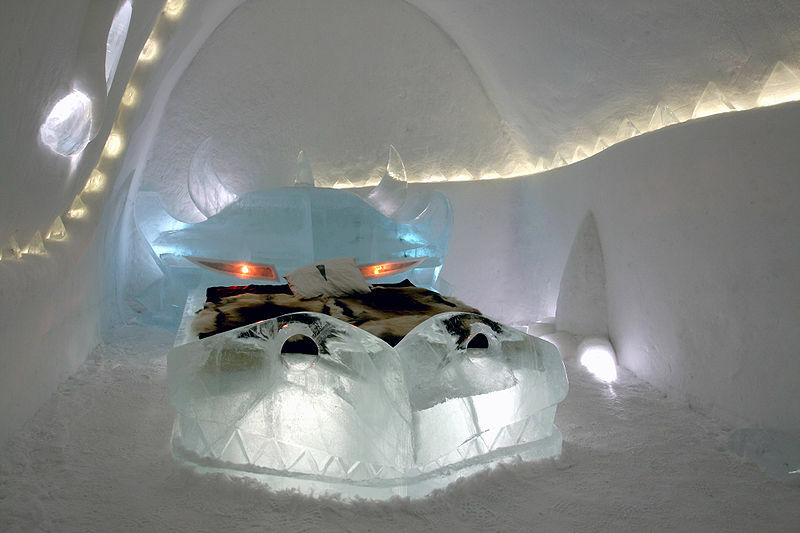 Each room or art suite is created with their own theme and the furniture including the bed are constructed ted using ice blocks over which a large mattress is laid plus traditional bedding such as reindeer skins. 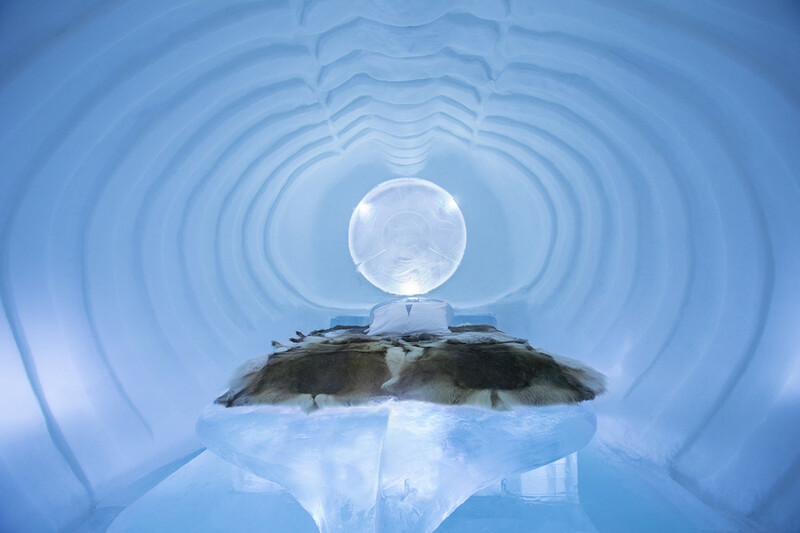 Guest are also supplied with a specific arctic sleeping bag, to ensure they stay warm at night when temperatures can be between -5 and -7 degrees celcius. Whilst the rooms are used as unconventional hotel rooms at night, during in the day the rooms form part of an art sculpture exhibition where visitors are able to wonder around the different themed rooms that have been created by artists from around the world. 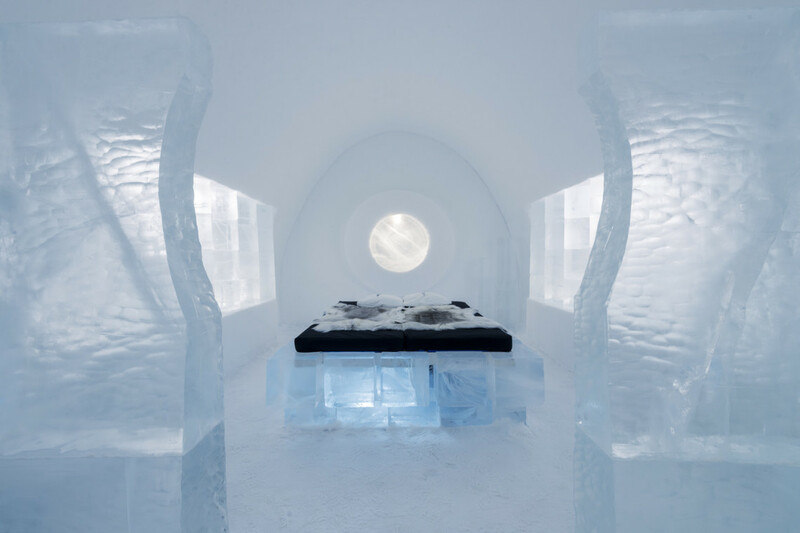 OVer the last twenty five years the Icehotel has expanded from an Igloo of around 60 square metres to the world’s largest Icehotel with a total ground area of over 5500 square metres. 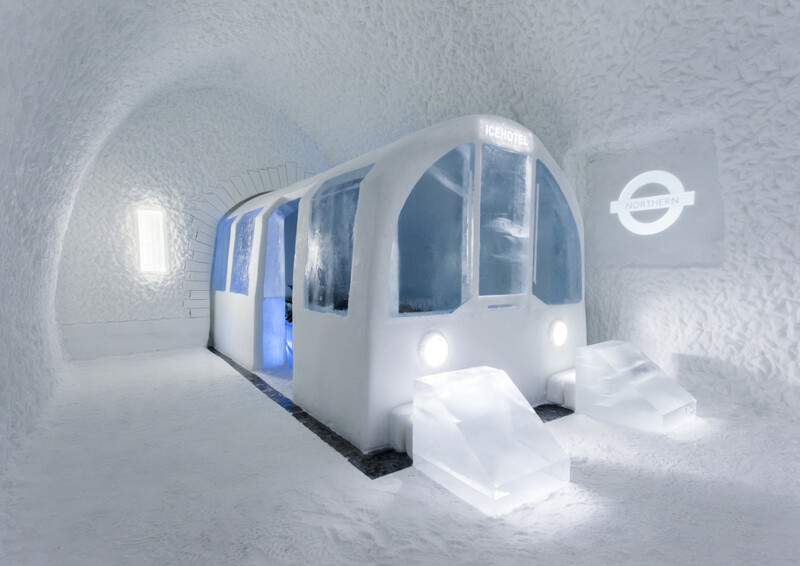 All of the rooms have different themes and the Mind The Gap London Underground themed room was a recent success with its recreation of a London Tube train leaving a tunnel where the carriage actually forms the actual bed enclosure where guests will sleep. 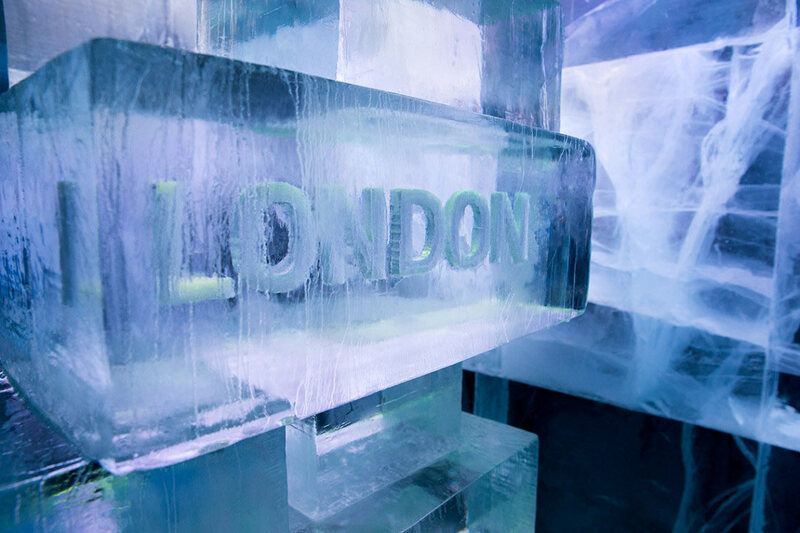 Just like an hotel the Icehotel features a gourmet restaurant plus over 60 bedroom suites, function rooms and all the usual amenities that you would expect to find in a hotel. The typical ‘season’ for the hotel runs from the first week of December through to mid April and hotel guests have reported that they were initially worried about how they would cope with the cold but they soon found that the arctic gear supplied by the hotel was so good they were often too warm! As with all Lapland destinations there is the usual reindeer sledge rides, husky dog trails, snowmobile tours and other arctic pursuits for guest to enjoy outside the hotel.